The February WER report looks at the future prospects of three FPSOs recently released from field, describes the competition for an elusive West African FSRU contract, reviews Hoegh’s decision to join Excelerate in exiting the FLNG market, assesses Petrobras timing and ability to proceed with two pre-salt FPSO tenders and discusses Chevron’s rationale in cancelling a GOM ultra-deepwater project. 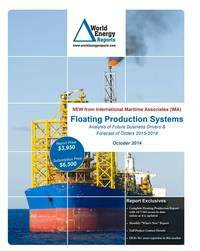 In the data section of the report are details for 257 floater projects in the planning stage, 62 production or storage floaters now on order, 280 floating production units currently in service and 30 production floaters available for redeployment contracts. Charts in the report update the location where floating production and storage systems are being planned, operating, being built and to be installed. Accompanying excel spreadsheets provide the report data in sortable format. Information is current as of 22 February.